CNG: eAuction 201. Germanicus. Died AD 19. Æ Dupondius (29mm, 16.10 g, 8h). Rome mint. Struck under Gaius (Caligula), AD 37-41. 201, Lot: 354. Estimate $750. Sold for $1101. This amount does not include the buyer’s fee. Germanicus. Died AD 19. Æ Dupondius (29mm, 16.10 g, 8h). Rome mint. Struck under Gaius (Caligula), AD 37-41. 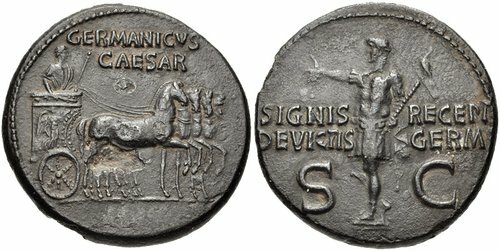 Germanicus in slow quadriga right; panel of chariot decorated with Victory / Germanicus standing left, raising arm, holding aquila. RIC I 57 (Gaius). Good VF, black patina with some earthen highlights, small pit below horses.